Running can be rough on the joints, especially in the knees and ankles. Running injuries are far too common. Taking preventative measures such as wearing a knee or ankle brace and doing strengthening exercises for your legs and core can help minimize your chances of injury. We understand that as runners, it is hard to stop running while you’re injured. Our selection of ankle and knee braces will help bring you support and alleviate pain so you can continue your casual or competitive runs. Remember to always seek treatment from a physician if you have incurred an injury. Our legs absorb most of the shock between our feet and the ground as we run. This means running can put a lot of stress on our knees, leading to knee pain or in some cases even ligament or cartilage tears. Other types of knee injuries caused by running include runner’s knee, patellar tendonitis and jumper’s knee. Aside from knee injuries, ankle sprains are common when running on uneven surfaces like trails. Runners with chronic ankle instability may also feel unsteady when running which is where an ankle brace will be of great benefit. 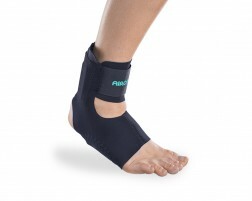 Running braces help provide the extra support and compression needed when moving around, keeping your joints healthy and helping to alleviate pain. For faster recovery, remember to cool down, stretch, and ice after your run. Our full selection of DonJoy Performance products is great for running. Designed for the athlete in mind. Get the support you need and keep running.